Jessica Sheetz-Nguyen, President of the ASDP Alumni Chapter, stepped down after five years of service as President of the Chapter. She will be succeeded by Dona Cady, Dean of Global Education at Middlesex Community College. Dennis Arjo, Johnson County Community College will serve as Vice President, Pamela Herron, University of Texas at El Paso, Matthew Ruane, Florida Institute of Technology will serve as Treasurer, James Deitrick, Barbara Lass, and Eric Spears, University of Central Arkansas,San Franscico Community College, and Georgia College respectively, will serve as Members-at-Large. Jeffrey Dippmann, Central Washington University serves as the ARCAS Representative, and Peter Hershock, Director of ASDP, guides the team as Alumni Chapter Advisor. The Chapter is in the planning stages for the 2017 annual conference, which will convene in Portland, Oregon. It will be hosted by ARCAS and Portland Community College. A call for papers will come out in September. The conference is open to all ASDP Alumni and EWCA Alumni. More information will be sent as it becomes available. The East-West Center Beijing Alumni Chapter and the Jefferson Fellowships hosted a dinner reception to welcome the fourteen visiting journalists from Asia Pacific and the United States in a lovely courtyard on May 7, 2016. It was a fun night of mixing, mingling and conversation. President Iraphne Childs reported that the Brisbane Chapter did not hold any activities during this quarter; as many are on vacation. Vasanthi Ranganathan from the Chennai Chapter reported that she presented a session at a corporation school, Kotur. They plan to do one more at the school where Thasleem is; Ranganathan is working on a highly innovative program for women empowerment. She conceived this project and received the help of EVAA and Rotary. The title of her talk was “Varavu Ettnaa Selavu Patthnaa,” on money management, education, and an important investment. This program also received assistance from Kalpana and Thasleem, both Fulbrighters. The Chennai Chapter members also launched a career series with the scholars returning after their program beginning July 5th. About 10 schools have been covered with about 200 students in each school. They will furnish the details when they are finalized. The Dhaka Chapter Leader, Abu Ekramul Ahsan reported the following: 1) Sad demise of Khaleda Ekram – One of the most active members of the Bangladesh Chapter, Khaleda Ekram, Former Vice Chancellor of Bangladesh University of Engineering and Technology (BUET) died on 24th May 2016. The chapter organized a memorial/condolence meeting on 29th May 2016 in Dhaka. A condolence note was circulated among the friends at the EWC and the chapters. 3) Sister Chapter Project – In the line with the recommendations of the EWC/EWCA, Chapters were paired off into two groups in order to establish a sister chapter and select a project to work on. The Bangladesh Chapter paired with Pakistan to identify possible projects. Consultation between the chapters are in progress; and 4) Exchange Visits of Alumni – Several alumni of Bangladesh Chapter visited alumni of other chapters in India (Kolkata and Delhi) to explore possible collaborative projects. All members of the chapter who went to the Manila conference were first time participants. They took part in the alumni talent night. When they came back from conference, they were motivated and excited. Participants advertised the meeting and introduced EWC to the other friends who became members of the chapter. During the chapter meetings, chapter members asked to make arrangements to visit the EWC. The chapter leader advised the group to wait for the next EWCA conference. All the new members are determined to participate in the next conference but before the next conference, they would like to visit EWC. In this respect, they are looking for some center event where they can participate; they proposed a visit during January 2017, since there is an upcoming conference on education 3-6 January 2017. If they get their visas in order to go to Hawaii, they will also visit EWC. Finally, we encouraged chapter members to introduce the EWC to our community, so that members are effectively informed about center activities and scholarships. 1. Raising of Funds for House of Light School. EWCA-IC has been focusing its activities for the students of House of Light School (HOLS) and the under privileged community people of that area, living 25 kms away from Islamabad in rural areas. The Chapter raised about Rs. 2.8 million (over US $ 26,500) for HOLS. The major donation was of Rs. 2.5 million was given by HBL Foundation for purchasing furniture, equipment and sports goods for the school. HBL – a leading bank in Pakistan supports prominent community service projects through the Foundation. Dr. Arjumand Faisel, Chapter Leader EWCA-IC, played a major role in acquiring this funding. The effort has been greatly appreciated by the Trustees of the school as it would help to meet some very important needs of the school. On the request of EWCA-IC, The Ministry of Climate Change sponsored “World Environment Day” at HOLS on 04 June. Senator Nuzhat Sadiq, Chairperson of the Senate Standing Committee on Climate Change and National Commissioner of the Girl Guides of Pakistan was the Chief Guest. Besides school children, the event was attended by their parents, area councilors, and several important personalities of Islamabad. The Chief Guest was delighted with the children’s performances and highly rated the event. Mr. Syed Abu Ahmed Akif, Federal Secretary at the Ministry of Climate Change, Government of Pakistan, also praised the school’s initiative and the children’s performances. Senator Nuzhat Sadiq: The Senator committed to raise the issue of silently cutting off jungles in rural areas of Islamabad. Syed Abu Akif Ahmed (Federal Secretary) He committed to give a donation of Rs. 750,000 (approximately $ 7500) to build a classroom for the 10th grade. (currently school does not have any classroom for 10th grade which will begin clases from August. Also, he will be inviting HOLS students to present skits, songs and speeches in different activities of the Ministry of Climate Change in Islamabad, which they presented on the day. Environment Day 2017 will also be celebrated at HOL School on a much larger scale. Ms. Nargis (Chief of Girls Guide in Islamabad) – She would like to initiate training of girl students of HOL School as girl guides, as soon as possible. 3. Iftari for the Members – Tayyaba Gul, General Secretary of EWCA-IC organized Ramzan Iftari (breaking of Fast at sunset) at her home. Members also brought food and it was very well enjoyed. Images can be downloaded at https://www.facebook.com/EWCAAISB/. On June 4, the Kansai Chapter had their Board Meeting. They had their General Meeting and Open Seminar/Live Hawaiian Concert at Doshisha University Clover Hall, followed by a reception. At the general meeting, Seiko Furuhashi, the chapter leader for over 6 years, completed her 2+ terms as the President. Yumiko Okamoto of Doshisha University became the new chapter leader as of June 4. She will announce her new board members shortly. • 2 May 2016, entitled ‘Placing Practice, Practicing Place, Global mobilization and the Production of Thamel”, by Benjamin J. Linde, Fulbright Anthropology scholar. • 6 May 2016, entitled ” Suicide in Nepal. A multilevel investigation into a neglected burden” by Ashley K. Hagaman, Fulbright student of Public Health. • 10 May 2016, entitled “Managing Diabetes in Nepalm Strategies for overcoming the silent epidemic,” by Ms. Nicole L. Ide, Fulbright student of Public Health. • 13 May 2016, Organic Farming in the Mid Hills of Nepal: Drawing from traditional and innovative knowledge to create highly sustainable small -scale system,” By Samantha J. Dey, Fulbright student of Agriculture. • 27 May 2016, The Making of an International University: “Perception of Medical Research and foreign medical students at Kathmandu University, School of Medical Sciences, Nepal,” by Devon P. McMahon, Fulbright student of Anthropology. • 15 April 2016: Nirendra Maske attended a Welcome Reception hosted by the President, NAHF, in Honor of H.E. the U.S. Ambassador Ms.Alaina B. Teplitz and a Talk program on US Policy in South Asia by H.E. the Ambassador of the United States of America to Nepal at Hotel Shangrila, Lazimpat, from 3.30 – 6.30 p.m.
Talk Programs: Senior alumni Mr. Anant Ram Baidya P.E. gave a presentation on “Earthquake Resistant Sattala”. Senior alumni Mr. Omkar Lal Shrestha presented on” Nepal- A Nation Trapped in Economic Stagnation and Global Irrelevance”. The presentations were superb and thought provoking and we were all enraptured by the authenticity and uniqueness of the research. They are so relevant to ameliorating the commotion, turmoil, political instability, bad governance, lawlessness and lack of accountability, transparency and indiscipline. The turnout was remarkably good. It was the biggest turn out ever and we are glad it was a great success, all because of your active participation. Great attendance and interaction. Our special thanks to EWCA seniors Ananta Ram Vaidya and Omkar Lal Shrestha for their thought provoking presentations which made us all wiser and more aware. Thanks also to seniors Soorya Lal Amatya and Rameshanand Vaidya for their charming presence. Our thanks to the MC, Mr. Sudershan Tiwari, for his excellent delivery for making the stage so lively, keeping us all smiles and on our toes. The entire cost of the EWC DAY Celebration was shouldered by EWCA, NEPAL CHAPTER, Kathmandu. The Food was Great and so perfect was the Venue. Thank you YALA MAYA KENDRA’. Forty-four people attended the Function. The President’s address: The Okinawa Chapter donation of N. Rs53,713 (equivalent of $ 500.00 US) to the Nepal Earthquake relief fund supplemented with a small donation shouldered by the Nepal Chapter will be utilized to build two toilets for school children in the earthquake devastated area. This will be the highlight of this EWC Day program. Sister Chapter Project: Ongoing talks between Brisbane, Philippines, and the Nepal Chapters seems interesting, as members raised ideas relating to disaster management strategies. The Nepal Chapter and others will soon discuss the idea. The Nepal Chapter also announced a special alumni event for the international New Delhi Media Conference, which will be held in New Delhi, 8-11 September 2016. They are exploring funding opportunities in order to help a couple of alumni members participate in the conference. The Kuala Lumpur, Malaysia Chapter did not have any activities for the second quarter. The Mumbai Chapter met recently with a depleted quorum as some members were on holiday. 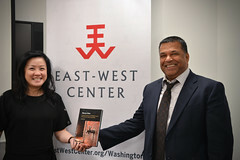 Those who met discussed the issues of the next president of the East-West Center, the forthcoming EWC International Media Conference in New Delhi, and the next EWC International Conference in Seoul. The New York Chapter had a dinner meeting at the Peking Duck House in midtown Manhattan on Friday, May 13. 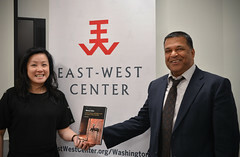 Nineteen people attended, including EWC President Charles E. Morrison and Jerry Finin, Director of the EWC’s Pacific Islands Development Program. Charles discussed the evolution of the EWC during his 18-year tenure as president, the status of the search for a successor, and shared some thoughts on the EWC’s future. Jerry discussed the PIDP. Our featured speaker was His Excellency Dr. Caleb Otto, Palau’s Ambassador to the United Nations. Dr. Otto gave an overview of his country, an archipelago of more than 500 islands, describing it as “a big ocean state because of the huge swatch of the Pacific that it covers. He also discussed the UN, his life as an ambassador and the search for a new secretary general to replace Ban Ki-Moon when Ban’s second term expires at the end of this year. The most encouraging aspect of the dinner was the presence of seven Asia Pacific Leadership Program (APLP) alumni. Another highlight was the arrival of the canoe Hokulea in June. Judy Otto, an EWC alum who is an advisor to the Palau Mission to the UN, as well as the wife of Dr. Caleb Otto, organized the UN’s World Oceans Day program on June 8, which included a speech by Palau’s president, Tommy Remengesau. Seven APLP alumni attended. Two APLP alumni, along with Judy Otto and EWC Chapter leader Bill Armbruster, attended a reception honoring the Hokulea crew on June 9 at the Museum of the American Indian, the former New York Customs House. The museum is part of the Smithsonian Institution. Dr. David Lassner, President of the University of Hawaii system — and an EWC alum — who served as a Hokulea crew member for the voyage from Washington to New York, was also at the reception. The Okinawa Chapter had the first regular meeting under the new leadership of Dr. Kiyoshi Nakachi on 12 June 2016 at the University of the Ryukyus. The meeting approved new leaders: Kiyoshi Nakachi (President), Munehiro Machida (Vice President), Kinuko Maehara Yamazato (Vice President), Rinda Yamashiro Kayatani (Secretary and Liaison Officer). They discussed joint activities between Chapters. The Okinawa Chapter invited the Obuchi Fellow Scholarship students in UH to talk about possibilities of joint activities with members of the Hawaii Chapter. Nakachi will discuss with members of Taiwan Chapter about joint activities during his stay at Taiwan. The Chapter meeting invited Mr. So Keisei, Director of Naha Branch, Taipei Economic and Cultural Representative Office in Japan and he gave a lecture on differences and similarities between Taiwan and Okinawa Cultures. Miss Rika Inamine, who received the Obuchi Scholarship at UH for 2016, was joined by her father at the meeting; he was introduced as well. Her parents, Seiichiro and Keiko Inamine donated and helped the Naha International Conference in 2014. Members of Okinawa Group (Takayama, Yamazato, Nakachi, Tsutsumi and Shibuya) are continuing to study abut APC (Asia Pacific Center) with members and non-members in mainland Japan. Prof. Won Nyon Kim, the chapter leader, has been trying very hard to bring the 2018 EWC/EWCA international conference to Korea and to make the conference a success. The conference committee held two meetings on the 29th of April and 8th of June. The possibility of inviting EWC/EWCA international conference has rekindled solidarity among the alumni, and many alumni voluntarily tried to contact the committee. They expressed a willingness to be of help in any form. The committee members are grateful for the encouragement and support of the alumni. Jin Suk Park is one such alumnus. He invited all committee members, ex, and present, to his summer house in the Yong In area. The gathering was a great success. It was a great fun to meet old friends and share stories from bygone days. It was a very useful and rewarding opportunity, too. The meeting was abundant with suggestions and advice! 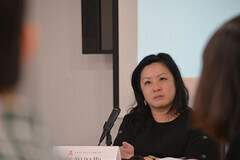 Alice Seng Seok Hoon reported that there was only one significant fellowship meeting during this period which coincided with the school one-month long vacation. Many alumni especially the senior group was away on holiday. The chapter managed to meet on Saturday, May 28 to discuss the sister project with its senior ladies. The Singapore chapter proposes a sister relationship with the Malaysian chapter with the objective of organizing activities/social gatherings together. Both chapters are having challenges of attracting younger members and it is hoped that through this initiative, we can bridge the gap, not only between countries, but also between generations. Though this idea was discussed during the 2002 EWCA conference in Malaysia, it did not take off due to logistical reasons. Singapore chapter would like to restart this relationship by end of this year. Two other small fellowship gatherings were also held on 30 January to welcome back Pushpa, who gave a paper at the Manila conference and on 18 February, we wished Siva well as he embarked on his doctoral program in Wellington University, New Zealand. On May 21, 2016, members of the EWCA So CA Chapter participated in the larger mortuary and later Sikh Temple Celebration of the Life of EWC alumnus-associate Vijay Trehan who had passed. Those EWCA So CA chapter members who could not be present will celebrate Vijay’s life with remembrances at their next chapter gathering on July 9, 2016. Vijay had served as their chapter treasurer for two decades, and he and his wife Sushma hosted their annual holiday gatherings at their home. Sushma asked EWCA So CA Chapter Leader Claire Langham to speak on behalf of the chapter at the memorial and she felt honored to have been called upon first among others to share their appreciation and celebrate Vijay’s life. Announcements have been sent out for their next EWCA So CA chapter gathering which will be on Saturday July 9, 2016 at the home of Inge Kendall Maranto. At this gathering, in addition to remembrances of Vijay Trehan, they will discuss details of the proposal for a project in conjunction with the EWCA Bali chapter. The Tokyo Chapter did not have many activities during this quarter; however, they did help the Jefferson Fellowship Program hold a reception that invited journalists and EWC alumni in Japan. They had a big turnout of over forty people, fourteen of whom were 2016 Jefferson fellows and eleven were Tokyo Chapter members. The Tokyo Chapter was happy to have made the necessary arrangements and financial contributions to the event. It ended in a great success. The Vientiane, Lao Chapter did not have any activities for the second quarter. This entry was posted in Alumni, EWCA Chapters and tagged EWCA APLP Chapter, EWCA Asian Studies Development Chapter, EWCA Beijing Chapter, EWCA Brisbane Chapter, EWCA Chennai Chapter, EWCA Dhaka Chapter, EWCA Faisalabad Chapter, EWCA Islamabad Chapter, EWCA Kansai Chapter, EWCA Kathmandu Chapter, EWCA Kuala Lumpur Chapter, EWCA Mumbai Chapter, EWCA New York Chapter, EWCA Okinawa Chapter, EWCA Seoul Chapter, EWCA Singapore Chapter, EWCA Southern California Chapter, EWCA Tokyo Chapter, EWCA Vientiane Chapter. Bookmark the permalink.